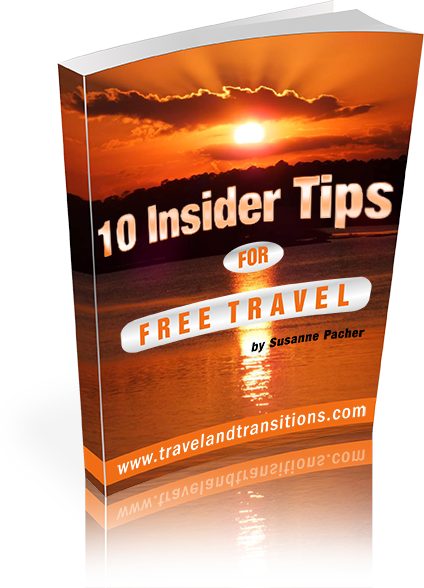 I had been really lucky so far – the weather in Sorrento had just been absolutely perfect, and April 25, 2013 was another magnificent day. On the plan for today was a visit to the famous island of Capri, located about 15 km or 11 miles from Sorrento. I took a nice walk through Sorrento and arrived in the harbor where there was a long lineup of people in front of the ferry terminal. I purchased my return tickets and got on the fast ferry and settled in for a ferry ride of about 25 minutes. On the ferry I linked up with two local tour guides, Gino Milano and Franco Coppola, who provided me great tips of what to see in Capri. They also recommended me to go on a boat tour around the island to get a view of Capri from the water. At around 10:30 the ferry arrived in the port of Marina Grande, and the entire port area was already busy with visitors. Capri is one of those destinations with a certain cachet and it has attracted increasingly affluent tourists over the past few decades. As far back as the ancient Roman times, Capri was already a popular holiday resort and various Roman emperors had vacation retreats here. During the months of July and August, Capri gets overrun by tourists so it’s better to visit outside of these two overcrowded months. As the local tour guides had suggested, I hopped on a sightseeing boat right away that went around the whole island. It also stopped at the Blue Grotto where passengers had a chance to transfer to a small rowboat and enter the magic grotto. I did not realize that we were actually making a stop at the famous Blue Grotto and due to the many visitors trying to get a glimpse, we were anchored for about 40 minutes, waiting for one of the small rowboats to come and pick up passengers from our ship for a short trip into the grotto. Many of the people that went on this excursion said that there were so many row boats inside the grotto that it was actually rather impossible to see the iridescent blue waters of the famous cave. 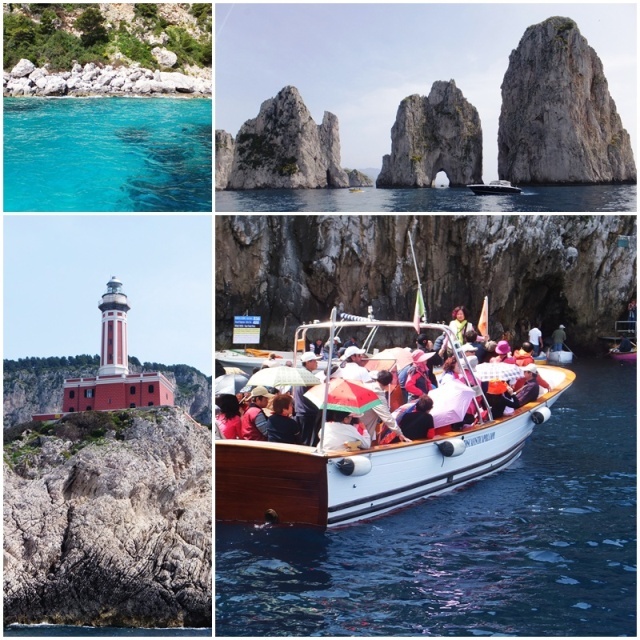 Finally, with the last visitor to the Blue Grotto back on board, we continued on our circumnavigation and admired Capri’s lighthouse, some interesting rock formations off the coast and the turquoise waters surrounding the many caves on the island. Now back in Marina Grande, I took the funicular from the harbour to the town of Capri. This pretty town has long been a favourite destination among jetsetters and the many designer fashion stores cater to an upscale audience. 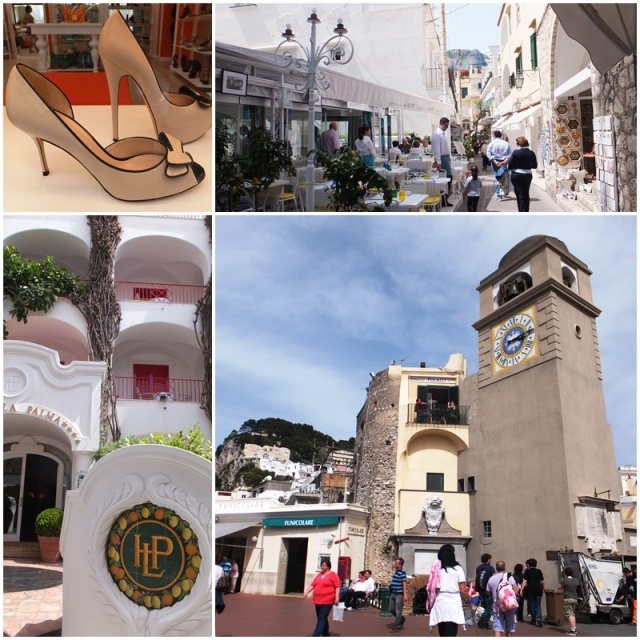 Capri is definitely a shopping mecca for anyone who enjoys pricy brand-name articles. Street cafes were already packed with people and I decided to get away from the crowded center of town and enjoyed a nice salad for lunch in the hills above the downtown area. 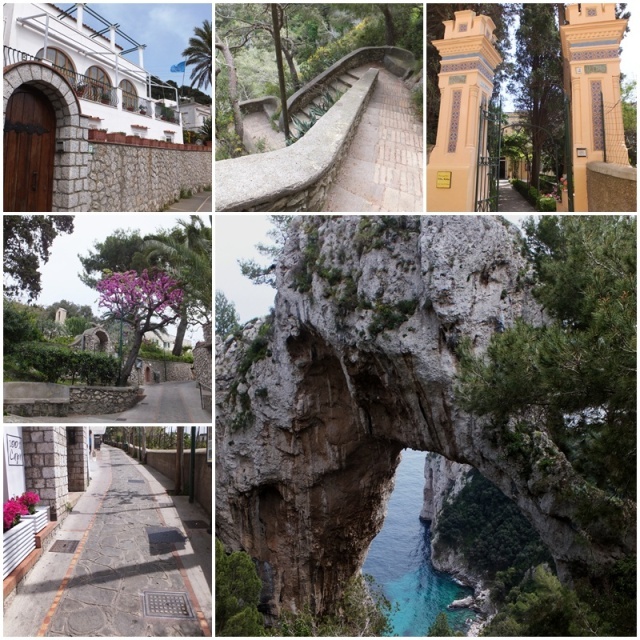 Now I was ready to embark on a walking tour of the island and I started with one of Capri’s most well-known scenic icons, the Natural Arch. It took me about 25 minutes from downtown to walk there on a scenic path and the view was well worth the visit. Located on the eastern coast of Capri, this natural limestone arch is about 18 metres high and spans about 12 metres. The walk there is extremely picturesque and close to the Natural Arch there is a nice restaurant with an outdoor patio. Capri is a walker’s paradise and after my return from the Natural Arch I was ready to explore another famous destination. 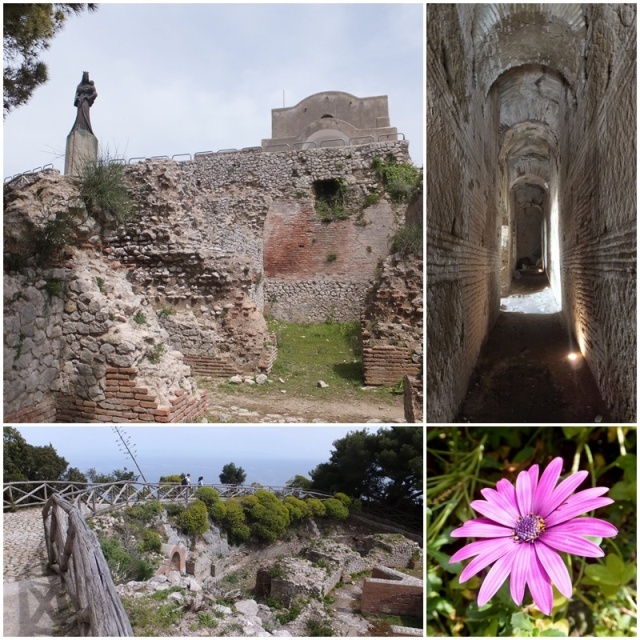 Villa Jovis is an expansive villa that was built in 27 AD on Capri’s second highest peak by Roman Emperor Tiberius and it is the largest of the 12 villas built by this emperor on the island of Capri. The walk takes you through beautiful neighbourhoods full of attractive houses and beautiful vegetation. Emperor Tiberius moved to this villa because he was afraid of assassination plots in Rome and with its well-guarded mountaintop location, Villa Jovis was situated in a secluded and safe spot and is said to have been a place of intense debauchery. With its precipitous rock cliffs, the view from Mount Tiberius, at 334 m above sea level, is absolutely breathtaking. From Capri I took the tiny public bus up to the even higher village of Anacapri which is separated from the town of Capri by a giant cliff. 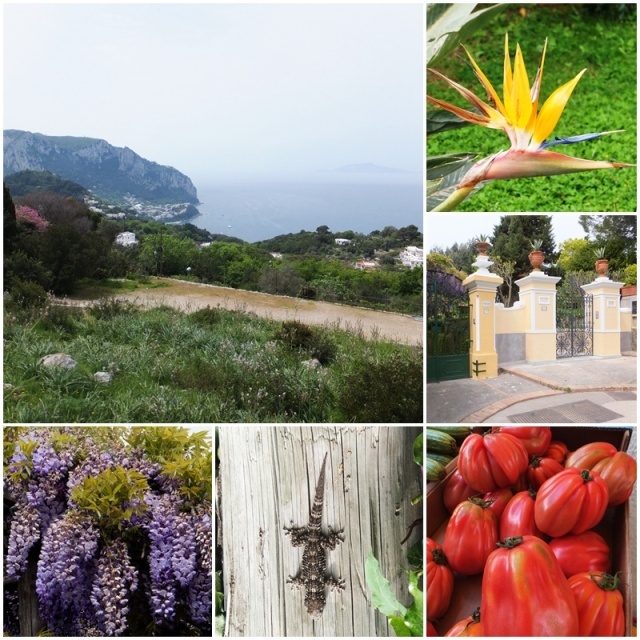 Anacapri is located about 150 metres higher than Capri and can only be reached via one main road. 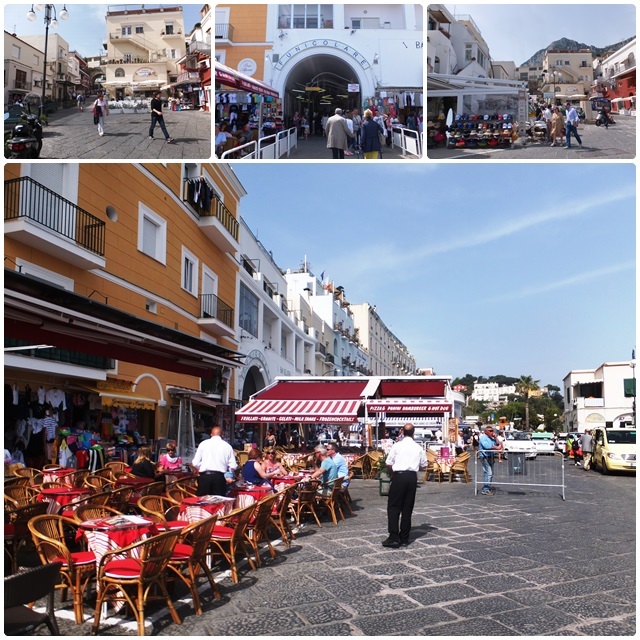 It’s a pleasant village full of restaurants and shops and less busy than Capri. Some of the main sights in Anacapri include the Villa San Michele, a 19th century villa that was built by a colourful local personality by the name of Alex Munthe, a Swedish citizen who came to island of Capri to cure him from a lung disease and fell in love with the beauty of this Mediterranean island. The highlight of the day was a trip on the chairlift up to the top of Monte Solaro, the highest point of the island at 589 metres. The so-called “Seggiovia” takes you up to the highest point of the island and on the single chairlift seats you can enjoy the view of the gardens below as they give way to pastures higher up on the mountain. The ride took about 15 minutes and at the top there is a restaurant surrounded by a large terrace that affords the most magnificent 360 degree views over the entire island of Capri. 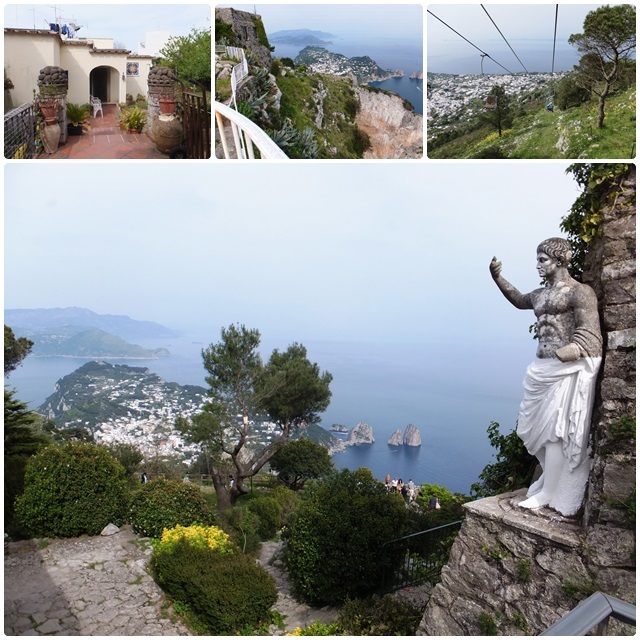 I came down the mountain in the last few minutes before the chairlift closed and was ready to take a bus down from Anacapri to Marina Grande to catch the ferry back to Sorrento. Several buses to Marina Grande passed by but they were absolutely packed and did not even stop. I waited for about 40 minutes and then decided, together with a family from England, to go to a less busy bus station and try our luck there. But again, no luck, we just could not get on the bus to get back to the harbour, so the 5 of us ended up hiring a taxi at 5 Euros per person to get back to Marina Grande and catch the last ferry back to the mainland. I arrived back in Sorrento by about 7:30 pm and just went back to my hotel to enjoy a relaxing evening after a fabulous outing to Capri. 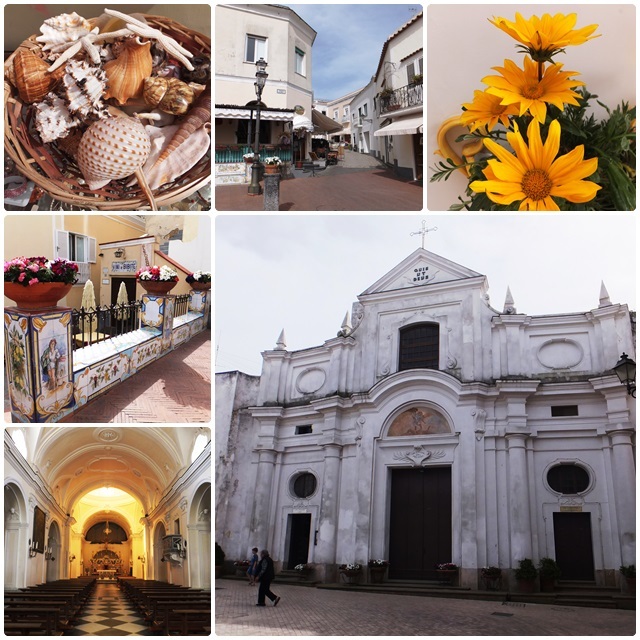 Tomorrow was going to be my last full day in Sorrento, and I was looking forward to seeing what this picturesque Mediterranean town had in store for me.